I was listening to RTÉ radio this morning and they were doing an archives thing about one of the periodic internecine feuds that tear at the entrails of Fianna Fáil. When I tuned in, a FF-er was screeching in a thick accent that somebody or other “should go back to Kildare!” Not “Go back to Kildare and check you haven’t left the cooker on” or “Go back to Kildare and take the road for Drogheda” or “Go back to Kildare and see if there’s any word of Paddy Reilly”. No, just “Go back to Kildare!” Delivered in a yelp of rage. Commentators are more direct. 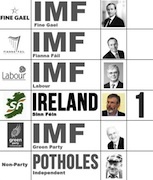 Miriam Lord spent one column a few weeks back referring to him as ‘Jarry’. That’s how he pronounces his name, you see - slap my thigh and split my sides! JARRY! Nearly as much of a laugh as Micheal Martin’s take-off of those Chinese. Eoghan Harris doesn’t mind Adams’s accent, doesn’t even mind his economics, apparently – it’s his morality that upsets Eoghan. And I heard a commentator this morning declaring that Sinn Féin were being impeded in their progress by the presence of Adams in the election, because he brought with him ‘baggage’. He does too – northern baggage. A radio panelist the other day said that yes, Bertie Ahern had his faults, but we should never forget what he’d done for the peace process in the north. In other words, Bertie has baggage, but his bag is a big shiny suitcase with his name and “I ended the Troubles” on it. When Gerry Adams’s baggage is referred to, southern commentators hint that his suitcase is marked “I started the Troubles”. Hero Bertie, villain Gerry : it simplifies things. And distorts. If you were to believe commentators, the peace process has been fathered by at least half-a-dozen people: Bertie, Albert Reynolds, Tony Blair, Bill Clinton, Ian Paisley, David Trimble – the list goes on. The truth is, there were two people at the heart – the real, beating heart - of the work that brought the peace process come into being. The first was John Hume. For his pains Hume was vilified on a steady basis by a cohort of southern hacks, most of them employed by Tony O’Reilly. But the SDLP leader stuck at it and eventually, the cease-fires came into being and the rest is history. John Hume took enormous political risks for what he believed in and it paid off. But there are political risks and there are life-threatening risks, and it was the second person who made the peace process possible who took the life-threatening risks. He kept on taking them for some fifteen years, until eventually the apparently-impossible had been achieved – the Good Friday Agreement. Everybody carries a range of baggage, but history will mark Adams’s suitcase with “He took the risks that made peace and joint authority possible”.